French President Jacques Chirac is reported to have cracked jokes about British food at a meeting with the German and Russian leaders. 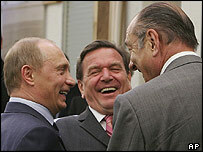 French newspaper Liberation says Gerhard Schroeder and Vladimir Putin laughed and joined in the banter. "One cannot trust people whose cuisine is so bad," it quotes Mr Chirac saying. A spokesman for Mr Chirac said the report did not reflect "the tone or the content" of the meeting, but stopped short of issuing a categorical denial. The comments, made within earshot of reporters, come in the run-up to the G8 summit in Scotland later this week. The three leaders met on Sunday for celebrations to mark the 750th anniversary of the founding of Kaliningrad, formerly known as Koenigsberg, an exclave of Russia surrounded by Poland and Lithuania. "The only thing they have ever done for European agriculture is mad cow disease," Mr Chirac said, according to the newspaper's report. "After Finland, it is the country with the worst food." A UK spokesman said: "There are some things that it is better not to comment on." Mr Chirac is also reported to have reminisced about an occasion when former Nato secretary general Lord George Robertson - who is Scottish - had made him try a local dish. "That is where our difficulties with Nato come from," he said, apparently speaking before the meeting was properly underway. The comments come as France and the UK compete to hold the Olympic games in 2012, and are at loggerheads over the EU budget. UK food critic Egon Ronay accused the French president of being "ill-informed" for his attacks on British cuisine. "A man full of bile is not fit to pronounce on food," Mr Ronay added. A spokesman for Mr Chirac dismissed Liberation's report as misrepresenting the focus of the meeting. "The quotes attributed to the president of the republic in no way correspond to the tone or content of the discussions at the Kalingrad meeting," he said. I presume this means that Chirac will be bringing a packed lunch to Gleneagles? On Wednesday Mr Chirac will be flying to Gleneagles for a dinner hosted by Queen Elizabeth II to open the G8 summit. The menu has not been published, but most of the food, provided by the Gleneagles hotel, will be locally sourced. "The Taste of Scotland is always to be enjoyed at the Gleneagles Hotel, from morning kippers or a fresh egg from a nearby farmhouse... to Angus beef, Scottish salmon, venison or Highland grouse for dinner," the hotel's website says.